A few months back, Gartner placed big data at the peak of its hype cycle for cloud computing, meaning most big data products are solutions looking for a problem. I always find this bad entrepreneurial habit to be one of the most frustrating of our industry. Having recently joined Meltwater as head of marketing and product (BTW Meltwater is hiring marketing and product managers! ), I think a lot about big data and how to unleash it’s value to solve important business problems, because that is our business. How does big data go from “so what” to “must have”? Big data is a by-product of the Internet and the ever increasing power of computers. Kind of like petroleum sludge. We know there must be great value buried within this vast, raw resource, but the challenge lies in figuring out how to turn it into something useful like plastic, or the other thousands of petroleum products that we produce from the 20% of crude oil that can’t be turned into fuel. This is no small feat. I can confidently predict that there will be no shortage of well-intentioned, well-funded start-ups that fail to live up to this challenge, producing varying versions of gift-wrapped sludge that never quite deliver on the promises of their pitches. Overcoming the hype and producing real value from big data requires much more than data-processing infrastructure. It requires a laser-like focus on creating order-of-magnitude improvements to how we work and live. More than a year ago, McKinsey and Company predicted that big data would be “The Next Frontier of Innovation, Competition and Productivity.” Now, I’m not generally one to argue with the likes of McKinsey, especially in this case as I happen to agree with it. If you have the time, I highly recommend checking out the report. At 156 pages, however, it can be a little hard to digest, so I thought I’d fearlessly attempt to boil it down to a blog post by sharinig a little of how we think about the Big Data Challenge @Meltwater. Big data implies a shift in real-time access to valuable information outside the firewall. sales, customer support, vendor management, employee recruiting, etc. Cloud-based businesses create value in one of two ways: lowering TCO (cost advantage) and network-enabled innovation (differentiation). Most early-entry, enterprise SaaS applications like Salesforce.com are really not that different from their on-premise counterparts in feature and function. They rely on lower TCO as the primary driver of adoption, and while they expand the market through lower prices to SMBs, they are locked into a replacement battle against on-premise software leaders like Oracle, SAP and Microsoft. However, there are a handful of truly innovative enterprise SaaS and cloud categories that mine the Internet for all it’s worth and have no on-premise equivalent, such as search, media monitoring, marketing automation, Web analytics, social media marketing, human capital management, and cloud integration. These categories all have one thing in common, they reengineer business processes that cross the firewall by leveraging data outside the firewall. Reengineering is a business term that gained popularity in the early nineties as client-server washed away mainframe applications en masse. The idea was to leverage the new technology to redesign business processes for dramatic gains in productivity, as opposed to just upgrading legacy systems. Fast-forward 20 years and we find ourselves in a similar situation. We’ve spent billions of dollars on ERP, CRM, BI and countless other software acronyms to automate every last internal business process. Inside the firewall, there is very little left to do. The vision of big data should not be an upgrade, like the next generation of enterprise business intelligence, only bigger. Big data is a fundamental shift in real-time access to valuable information outside the firewall. It offers the opportunity to reengineer business processes that cross the firewall and that benefit greatly from this information, such as competitive strategy, sales, customer support, vendor management, employee recruiting, etc. For example, it is one of the great ironies of enterprise software that in most companies customers never touch the customer relationship management system. If any emerging category can claim more hype than big data, it is social business. This is no accident. Social business and big data are inexorably linked. Big social data empowers social business. 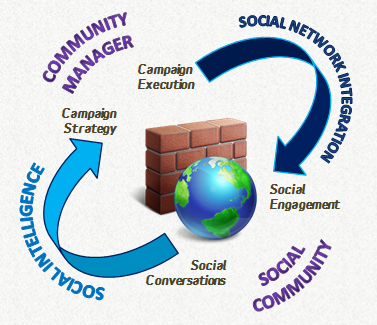 Take the case of the social community manager, a new and evolving social business role. 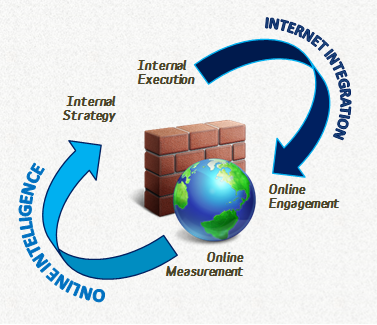 The social community manager must engage in a dialog with community members that is personal and relevant. Yet at the same time, the social community manager must sift through millions of online conversations to zero in on specific opportunities for personalized social engagement. Enter big data. Let’s redraw the above diagram for the social community manager. the conversations, channels, and community members that require immediate attention. I think social community management is a lot like air traffic control, including the potential for social media disasters when information, systems or social community managers are not up to the task. The social community manager must digest vast amounts of big data to find the one conversation or one community member that requires immediate attention. The social community manager doesn’t need raw big data. The social community manager needs a social mission control panel to digest the vast amounts of big social data and zero in on the conversations, channels, and community members that require immediate attention. The fact that big data originates largely as a by product of the Internet, and the fact that it is, well, big, lead to the natural conclusion that like big data itself, big data-based solutions are best situated in the cloud. It will be the rare global 500 company that is both big enough and motivated enough to house and sift through the mountains of data available out there to build on-premise big data analytics and automation. Economies-of-scale will rule in the aggregation, enrichment and processing of big data with most businesses interested in paying only for results, i.e., insights that can be used to reengineer business processes across the firewall for order-of-magnitude improvements in productivity and service. Congratulations on the move to Meltwater. They’re a great company! Congratulations on keeping Chaotic Flow flowing!